“Best Online Bingo Site of 2016” boasts Tip Top Bingo when you first visit. As far as I can find out, there has been no official award given, this is simple a confident announcement from a brand new site, or an overly cocky statement from a site that has not yet developed the reputation to make such a claim, which of the two it is remains to be seen. But with such a highly competitive market as the online bingo scene, having confidence is not necessarily a bad thing, and at first glance Tip Top bingo looks capable of backing up its boast, but more than first glance is necessary to prove a site as the best of the year, especially when the year is not yet halfway through. A part of the Dragonfish network, but more of a standalone site than most of its sisters are, Tip Top Bingo definitely shows the ability to be at least one of the best bingo sites of this year, with excellent promotions, good gaming options, and a refreshing design concept. The majority of online bingo sites that you find will go out of their way to bring the most colour, animation, and noise as possible to ensure that your eye is caught at every turn, but Tip Top Bingo has chosen to take a pleasingly different road. An incredibly simple design theme, predominantly incorporating white as a colour scheme greets you on arrival, making it clear quickly that this site does things a little differently. Small pink and green additions to the colour scheme with a very happy looking lady smiling at you from the top banner are as close to strong aesthetic statements as you get here, which works a treat. The design work at Tip Top Bingo is an exercise in subtlety, executed with textbook efficiency. There are several games directly accessible from the homepage, and the navigation is simple with clear, concise sub-categories to make it easy to find exactly what it is you’re looking for. There’s nothing bad to say here, everything is pretty much perfect. By looks at least, Tip Top Bingo may very well be the best online bingo site of 2016. When it comes to games, you’ll get a good amount of choice at Tip Top Bingo, and that is not restricted solely to bingo sites, although obviously there is a focus on this particular game type, as well there should be when a site has ‘Bingo’ in its name. Bingo games include the two most popular variations, 75 ball and 90 ball, as well as Swedish high five bingo thrown in for good measure. There’s a whole host of rooms available to play in, from normal bingo to speed bingo and with different wagering amounts, so whatever type of bingo game you are looking for, you are unlikely to have to wait long to find a room that is providing it! 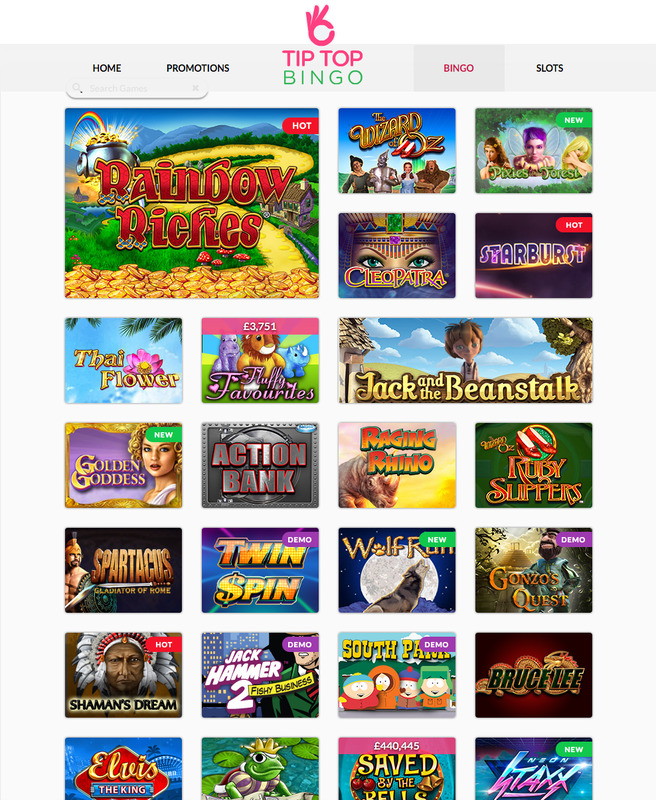 If you like some variation in your gaming experience, then Tip Top Bingo has a pretty good selection of slots for you to choose from. Popular slots available here include Starburst, Fluffy Favourites, Rainbow Riches, Cleopatra, TwinSpin, Jack and the Beanstalk and more, so if you’re a fan of an old favourite, this is a good place to visit. As far as new slots go, there is not as much to offer, but you will find a couple of gems from recent months including Guns ‘n’ Roses and Koi Princess. Tip Top Bingo is a very, very good bingo site, and is highly recommended, but best of the year? Probably not.